In the last month I have become the poster child for Survival International in what appears to be a nasty internecine fight between them and WWF. I had never heard of Survival International before and never encountered them in all my years of travelling, working and hunting around Africa but there you are. 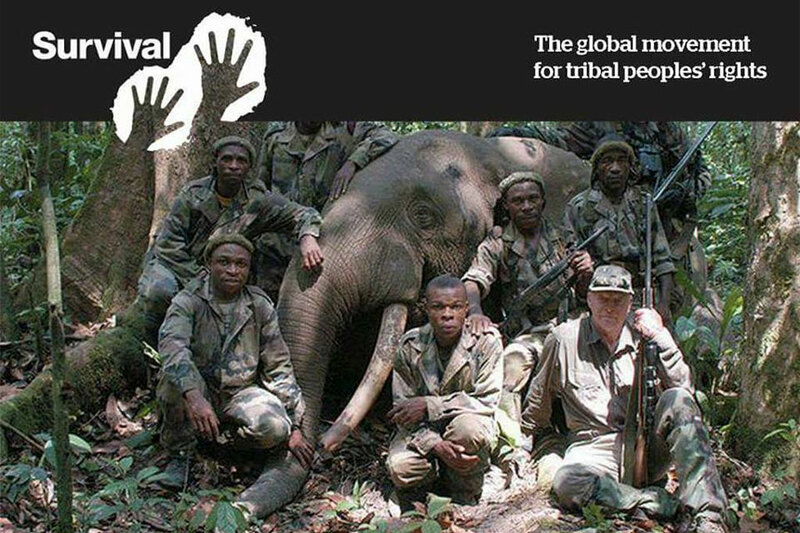 They purport to act on behalf of indigenous people around the world and have used a photo of my Cameroon rain forest elephant hunt, without my permission, as a stick with which to beat WWF – of which I am a member and trustee – in their attempts, as I see it, to divert the flow of funds from urban wallets into their bank account as opposed to that of WWF. I have never hidden my hunting activities, in fact, just the opposite. This hunt was the subject of a magazine article back in 2005, was covered in my book, Hunting Icons of Africa – The Top Twenty-Five Trophies and the DVD, Flack Hunts Cameroon, which sold over 5 000 copies over the years. I was sent a series of written questions, however, by WWF South Africa regarding the hunt, which I duly answered the next day and then asked them a few of my own. Apparently, they disliked my questions so much they have asked me to resign from the organisation of which I have been a member and trustee for many, many years. Of course, the real reason is probably that, as a hunter and believer in sustainable use, I have become an embarrassment to them. I will not resign. They will have to expel me and, if the reasons given for requesting my resignations are true, then I will have been expelled for asking embarrassing questions. Set out below is the exchange between WWF South Africa and me, which was initiated by them on 3 November 2016. You can make up your own mind. Besides the fact that I was only this morning shown (by Amy Goldblatt) an email from you regarding your having ‘a problem with the CEO of WWF’, there is another urgent matter that now needs attending to. You will note the email correspondence below from WWF International. It relates to a photo of you with a dead forest elephant in Cameroon that is now being used in a campaign to lobby against WWF. The caption names you as a Trustee of WWF. The content of the mail below is self evident. WWF is already accused by Survival International of having moved communities out of areas in favour of hunting concessions, so there are great sensitivities. WWF is contesting that interpretation. We now need to develop a response, and I wish to get as many facts on this matter as possible. I have also asked my WWF colleagues in Cameroon to answer similar questions to the best of their knowledge. When did you shoot this elephant ? And where precisely? Can you give us details of the outfit and/ or community programme that you hunted with? Can you confirm that you had all of the legal permissions to do so (I know that you are usually very attentive to such matters)? What authority provided such permissions? What particular authority determined the hunting quota of forest elephants for the concession in which you hunted? Do you know what the annual quota was? Do you know whether forest elephants are still made available to hunters in that area (given the recent drastic due to poaching)? What did you pay to shoot the animal and who were the beneficiaries – both direct and indirect? Can you share anything further about the distribution of benefits in support of the local community? Please add any further information if you wish. My Communications team have shown me the blog you wrote on what I assume was this particular hunt. I shall appreciate your most urgent response to these questions. Once this is done, I would welcome a conversation on your ‘problem’ with me. Perhaps I can then convince you that WWF has evolved from being run like a Club, to becoming a professional environmental organisation. I hunted a rain forest elephant (Loxodonta cyclotis) in 2005 in the rain forests in the south eastern corner of Cameroon in the 125 000 hectare, unfenced, Mayo Oldiri safari hunting concession, out of Lognia camp, which is about a three hour drive from Kika, the nearest village to the south east and close to the border with the Central African Republic. 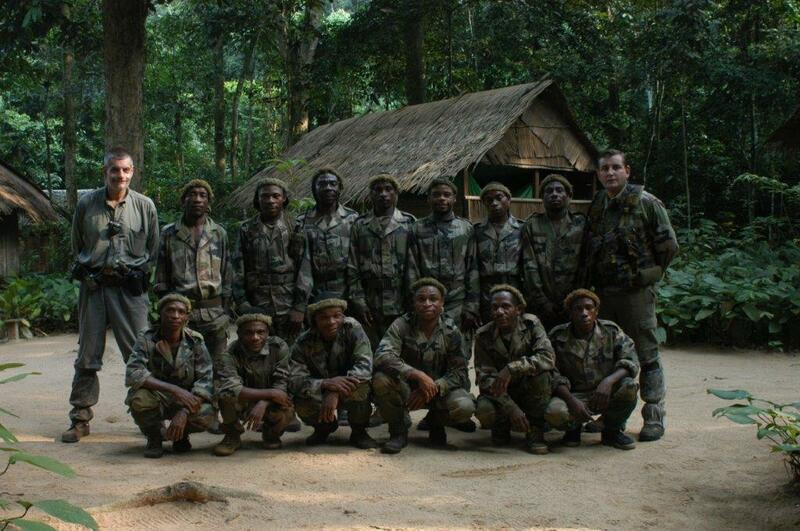 The elephant had killed one of the Baka Pygmy trackers, known as Jean van Damme, the week before I arrived according to the Pygmy trackers with whom I hunted. 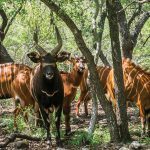 The safari outfitter, Mayo Oldiri, is owned by Antonio Reguera, a Spanish citizen, and has operated in Cameroon with the obvious permission of the Cameroon government for over 20 years and continues to do so today in both the rain forests and savannah. I have hunted with them in Cameroon twice and, to the best of my knowledge and belief, there has never been a complaint raised against them of any kind whatsoever. I confirm I had all necessary permissions to hunt in Cameroon else I would have been unable to export any of the skins, ivory, tusks and horns as both require government and veterinary permissions from both the Cameroon and South African governments as well as CITES. The full mount rain forest elephant which I hunted can be seen in the Iziko Museums of South Africa in Cape Town. My taxidermist, Rodney Kretzschmar of Trans African Taxidermy, accompanied me to Cameroon and dealt with all the paper work necessary to export/import the skins, ivory, tusks and horns, which ivory bears the relevant CITES numbers and are on display in my home. The quota for all game hunted in Cameroon is, to the best of my knowledge and belief, determined by the government and I do not know what the quota for elephant was in 2005. What I do know is that the full quota was hardly, if ever, used and very few rain forest elephant were hunted in Cameroon, as opposed to poached, as it is difficult and dangerous to hunt them as my articles and books on my hunt make clear. Most knowledgeable hunters will say that rain forest elephant hunting is the last great hunting challenge and adventure in Africa for this precise reason. When I was in Cameroon, rain forest elephants were the most numerous animals in the rain forest but I have since been reliably informed that persistent and uncontrolled poaching for ivory and bushmeat has dramatically reduced their numbers and increased their aggressiveness. I do not know whether elephants are still hunted in the Lognia concession but I could find out if given time. What I do understand is that aggressive, uncontrolled poaching has dramatically reduced all wildlife in the region. To the best of my knowledge and belief, there were no and never have been any villages in the Lognia concession, which was completely devoid of people in 2005. The outfitter employed nearly 40 people in the hunting camp and they and their families were housed in a village adjacent to the hunting camp. As can be seen from the attached photographs, they were well clothed, well fed, well paid and well trained. The outfitter employed a full time, eight man anti-poaching squad, which were effective in catching poachers, although the local police, often being those who supplied the weapons, logistics and support, hardly ever prosecuted the individuals caught. I cannot remember what I paid as a licence fee for the elephant but, to the best of my knowledge and belief, the entire 28 day hunt, during which I also shot a dwarf forest buffalo, a giant forest hog and three forest duikers, including gratuities for the staff, cost in the region of $45 000.00. The beneficiaries were the safari outfitter, its employees and their families, the shops in the area (via purchases by the safari outfitter), the government (via taxes and licence fees) and the wildlife through the reduction of poaching due to the hunting and the anti-poaching efforts of them both. Articles and photographs of the hunt in question have been published in magazines and books from 2005 to as recently as 2009 and it seems as if Survival International must be desperate to try and damage WWF for them to rake up these old coals. The real pity is that there has not been more hunting in Cameroon as this would have provided more employment and anti-poaching efforts, both of which are desperately needed in this corrupt and incompetently managed country. Leadership and, preferably, strong, decent and visionary leadership. A three year plan (or longer) for the future development of the organisation prepared by the team responsible for its implementation and which many refer to as a strategic plan. An integrated and motivated management team with the necessary diverse skills to implement the strategic plan. An action plan which sets out and measures the steps necessary to implement the strategic plan. Why does WWF not have a strategic plan produced by its management team responsible for is performance? If it does have one, why is it not communicated to its stakeholders on a regular monthly or annual basis? Why does WWF appear to be seemingly directed by one person i.e. you? I have participated in a strategic planning exercise conducted by John Hanks some years ago but nothing has been heard about it. Why? Why does WWF appear to have no action plan to give effect to its strategic plan and which is measured on a month to month basis and reported on a monthly basis to its trustees at the very least. Why does the annual report not mention either the strategic plan or performance measured against it? Please add any further information if you wish. I look forward to receiving as prompt and detailed a reply to my email as I have given to yours. 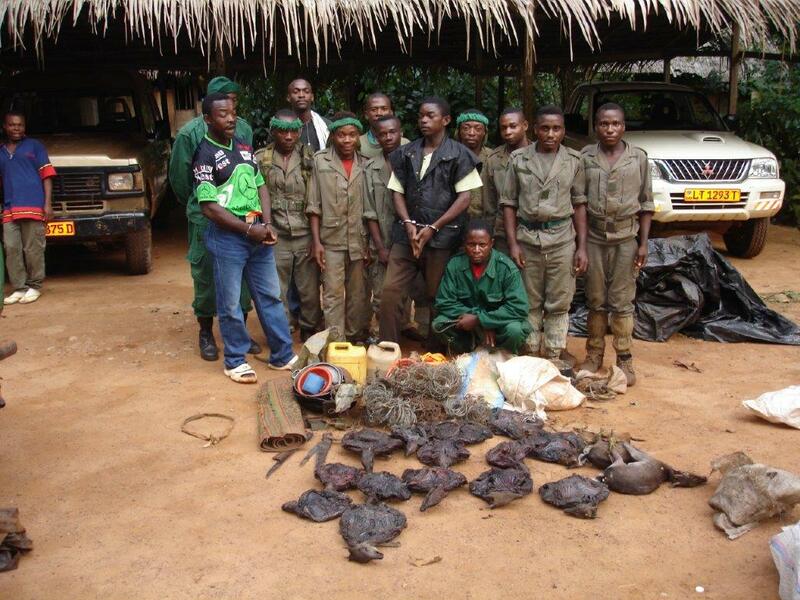 The anti-poaching squad at Lognia camp and two handcuffed commercial bushmeat poaches arrested by them along with their booty of smoked meat, recently killed animals, traps and snares. 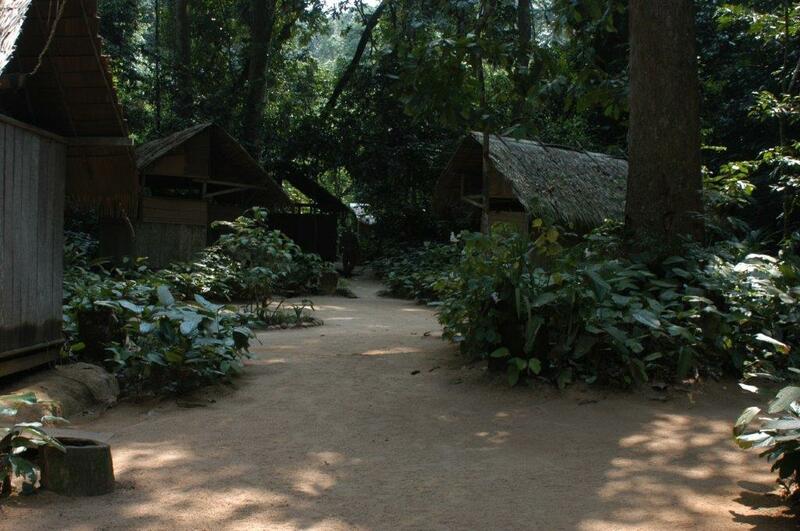 The main Lognia camp situated about 50 metres to the west of the Pygmy camp. 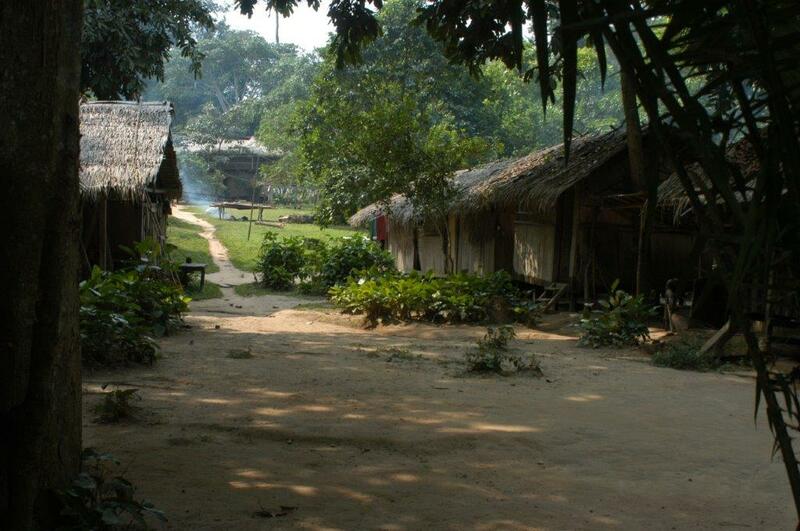 The Pygmy village at Lognia camp with the elephant meat being smoked in the middle. The Pygmies ate the entire elephant I shot in ten days. I appreciate your detailed response to my queries. This is helpful. Thanks. The information you supplied is exactly what I needed. The rest of your comments about WWF South Africa (and myself) shows just how significantly out of touch you have become. In fact, I have not encountered a single trustee who has had so much to say about the organisation with so little knowledge of it. That is not to say that my colleagues and I at WWF cannot do better on many different fronts. I am happy to meet with you if you wish me to attend to your detailed set of complaints, including my ability to run an organisation. I shall make sure that Valli Moosa, the Chair of the WWF South Africa board, receives an unfiltered version of your gripes. It is to him and the South African board to whom I am accountable, and who make quarterly judgements of the progress of the organisation in general, and myself in particular. Emelda Driesen, my PA, will make sure that we get to meet soonest. Given your lack of involvement as a trustee in WWF, your total lack of support for the organisation, and your intensely critical attitude towards the current organisational strategy in general, and the CEO in particular, you are not contributing towards WWF South Africa as an ambassador nor as an advisor in your role as a WWF-SA trustee. The Board hereby exercises its discretion in terms of Clause 8.2 of the WWF South Africa Constitution (approved on 14 November 2014), to request that you resign from WWF South Africa as a member and trustee with immediate effect. You are no longer to refer to yourself in any forum or form (including but not limited to social media platforms and the media) as a trustee of WWF South Africa. I agree I have not been directly involved in the affairs of WWF for some time. I deny that I have a “total lack of support for the organisation” and put you to the truth of this allegation. I deny I have an “intensely critical attitude towards the current organisational strategy in general, and the CEO in particular” and put you to the truth of this allegation. I deny, I am “not contributing towards WWF as an ambassador nor as an advisor in your role as a WWF-SA trustee” and put you to the truth of this allegation. I have helped WWF in the past when my assistance has been requested and been willing to assist WWF where I can but I do not know what the strategy of the organisation is nor its action plan, which makes it difficult, if not impossible, to be proactive. I am a member of six hunting and conservation organisations, here and abroad, where WWF comes in for frequent criticism and regularly defend it. I do not understand how asking questions of the CEO regarding the strategic and action plans of WWF South Africa amounts to an “intensely critical attitude”. I would think that this is evidence of someone wanting to become more, not less, involved in the affairs of WWF. But even if I did display this “intensely critical attitude”, what is wrong with that, especially when the CEO himself agreed to meet me and provide the answers to my questions as per his email to me dated 4 November 2016? In addition, our constitution guarantees our right to freedom of speech. In the six years from 2006 to 2012, at a cost to myself of over R1,5 million, I researched, scripted, filmed, edited, produced and distributed over 7 000 copies of the documentary, The South Africa Conservation Success Story, narrated by Dr David Mabunda and Mr Shane Mahoney. The script and rough cut of the documentary was given to Mr Mark Read (then chairman of WWF South Africa), for comment prior to finalisation and received his tacit approval. He arranged for a copy of WWF South Africa’s logo to be given to me, which was incorporated in both the DVD and book of the documentary. In 2012 the documentary was awarded the Environmental Prize by the prestigious European body, CIC – The International Council for Game and Wildlife Conservation, which counts 38 countries, the FAO, CITES and TRAFFIC amongst its members. Copies of the DVD have been given to every member of parliament, the text of the documentary was given to some 3 500 attendees at the recent CITES conference, copies of the DVD and/or book have been sold and/or given to thousands of people. Every child or school principal who asked for a copy has been given one free of charge. In the five years since 2012, I have written and edited five comprehensive books, at the rate of one a year, on the 30 spiral horn antelope species recognized by both Rowland Ward and Safari Club International. I, the last two years I have written a number of articles for magazines here and abroad criticising canned killings and the intensive breeding and domestication of wildlife to produce animals with exaggerated horn lengths and unnatural colour variations. During 2016 I participated in the 50:50 television program and a BBC radio program on this subject. Over the 20 odd years prior to 2006. I converted a bankrupt, eroded sheep and Angora goat farm into a model, extensive game ranch. I removed all the internal fencing, game fenced the property, re-introduced game species that had been there before and rehabilitated hundreds of hectares of eroded, over-grazed veld. Last year I received the Bataleur Award from the South African Hunters and Game Conservation Association, with over 40 000 members the largest association of its kind in the southern hemisphere, for my role, amongst other things, in conservation in this country. This is the association’s highest award. While some of your other members and trustees may have been better ambassadors than me, I am certain that others have not. While I do not have a copy of the constitution – and I hereby request that one be emailed to me as a matter of urgency – I submit that to summarily request my resignation as a member and trustee on the grounds advanced by you is irregular, procedurally unfair, unwarranted and substantially unfair, especially as I was not given a chance to address the board of directors and answer the charges of which I have been accused. I believe the actions you have taken are a pretext to rid yourself of a member and trustee who supports and practices the fair chase of game on a sustainable basis which, as the above documentary showed, has been the cornerstone of conservation in the country and the main driver of the growth in both wildlife numbers and the area of land under wildlife. If paragraph number 6 above is accurate, then this is an insult to the 300 000 hunters in South Africa, the 13,4 million hunters in North America and the children of the president elect of the USA, not to mention all hunters around the world. I refuse to resign as either a member or trustee of WWF South Africa and reserve my rights in this regard. World Wide Fund for Nature (WWF) trustee Peter Flack with the forest elephant he killed. Outrageous: Baka abused to make way for trophy hunters! Baka “pygmies” are being arrested, beaten and tortured for entering their ancestral forests since they were leased to French billionaire Benjamin de Rothschild for big game trophy hunting. Armed guards threaten to shoot the hunter-gatherers on sight. Their crime? “Trespassing” in the “protected areas” to provide for their families. Meanwhile, tourists can pay de Rothschild €55,000 for the privilege of shooting a forest elephant. We think this is wrong, which is why we’re giving the Baka a platform to speak out against the theft of their land and the abuse they are subject to. 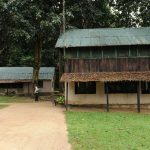 Of course, what gives the lie to the assertions by Survival International is the fact that it is impossible to hunt the rainforests without the help of the Pygmies, so why would you want to alienate the very people whose help is critical by supposedly treating them and their families so badly. 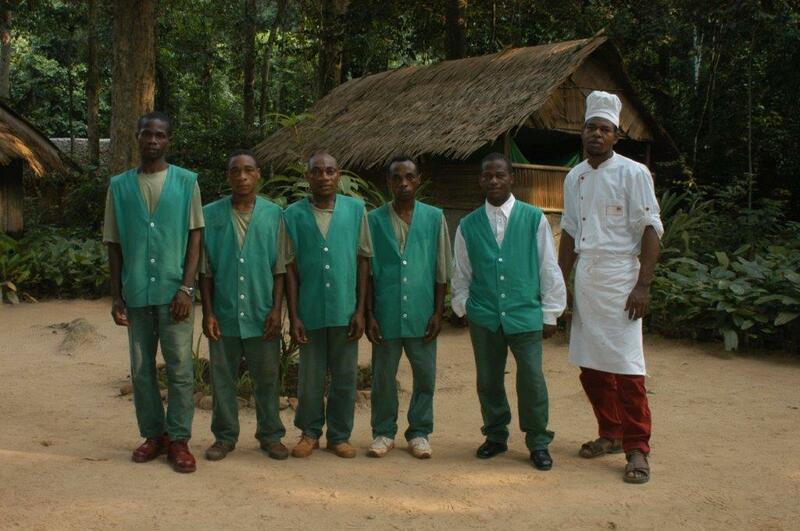 In this regard, I attach hereto photos of the Pygmy tracking staff, camp staff, anti-poaching staff of Lognia camp where I hunted as well as a photo of the Pygmies smoking the elephant meat from the bull I shot and which they ate over a period of ten days. Dear Mr Flack,, It would seem to me that the WWF has come under tremendous pressure from this so called Survival group who are in fact no more than Eco Terrorists out to ban all hunting and pocketing large sums of donated money into their very deep pockets.. They have absolutely zero knowledge or compassion for Conservation whatsoever and are merely trying to lead readers into a false perception of their own interests. We all know as hunters,, that Conservation is the primary result of hunters and hunting per se… Hunting has never been an offshoot of conservation or the efforts of conservation… Conservation,, in all its forms and angles, is a direct result of the interest of hunters who as we all know, were the first to place value on the animal and by doing so, has ensured the survival of all species as we know. As co- founder member of Namhunt or Namibian Hunters and Game Conservation Association, we are proud to associate ourselves with the successes of our South African counterparts and we enjoy the full support of their management and wide membership. Please trust me when I say that you would be better off in disassociating yourself from an organisation which no longer requires your valued membership and support due to being totally hijacked by the Anti Hunting brigade… Please do carry on with your efforts in a way which would as always,benefit conservation and hunting all over Africa.. Thank you so much for your very kind words, Chris. Bless you, they are a real comfort to me as it is never nice to be expelled from anything, let alone an association of which you have been a member for over 30 years, particularly when your only sin was to be a hunter and ask a few legitimate questions. Your comments are both an encouragement, on the one hand, but humbling, on the other hand. If I have played a positive role, no matter how small, in the hunting lives of your son I am both grateful for the opportunity and cognisant of my responsibility, which I guess all us older hunters should and do feel. Thank you for taking the time to explain things from your perspective. I understand that hunting can play a part in conservation — that’s not what worries me. What worries me is the rest: the torture, violence and evictions that SI is talking about. Are you saying that these Pygmies are all lying? I have seen SI say before that the Pygmies are often “poachers” under the law when they set foot inside conservation zones or subsistence hunt. All the videos they have convince me that this is right — what other explanation can there be? Thank you for your comment. I watched the brief video clips to which you sent me the links. I confess that, as an ex lawyer, they raised more questions than provided answers and I did not find them convincing. They did not answer the most basic questions. Where and when did these atrocities take place? Who were the safari companies concerned? Without this information how could I begin to use my influence with ‘these companies’ you refer to when no-one even knows their names. On the other hand, I admit am no expert on the rainforests. I have only hunted them six times in CAR, Cameroon and Congo and have never seen or heard any sign of the atrocities mentioned. If I had, I would be the first to support the claims of SI who I have also never come across in over 30 years of doing business in and travelling across over 19 countries in Africa. The Pygmies are key to hunting the rainforests. In fact, it is impossible to do so without them. To alienate them in any way makes absolutely no sense and you cannot separate the Pygmies who work for the safari companies from those who live in or use the rainforests. They are all inter-related in a given region. Pygmies were used by one of the safari companies I hunted with to catch poachers and the ones I saw caught and photographed were well off, Bantu, commercial meat poachers. I also found it strange that the one Pygmy mentioned the perpetrators of the atrocities were army and police personnel because, more often than not, they were the very people in cahoots with the commercial meat poachers and supplied them with guns and ammunition. I have never come across a Pygmy village or the remains of one in any hunting area or heard of them being burnt or destroyed. This would be an exercise in futility because it would take them less than half a day to rebuild their flimsy and temporary structures from the local materials they use. I have heard about local Bantu commercial meat poachers employing Pygmies to do their poaching for them but never saw or heard of any Pygmy being caught, much less beaten. And as for anyone of these army or police personnel catching a Pygmy, well, I would like to see this. The Pygmies would vanish before any of these clumsy, non-forest inhabitants ever so much as laid eyes on a Pygmy. It takes a normal size person, on average, an hour to cover a kilometre in the rainforest, whereas the Pygmies cover the same distance in a quarter of the time. Fortunately or unfortunately, I can only talk about what I know or have heard from reliable sources and none of this confirms the allegations of SI or the three men in the brief videos.